LED lights / LED light bulbs will save a significant amount of money on your electric bill because they use just a fraction of the energy compared with traditional ‘incandescent’ light bulbs. More and more people are switching out their old light bulbs with LED lights as the prices have dropped significantly. The most common incandescent light bulb (‘tungsten’ filament) is 60 watts. Most people (especially ‘old timers’) have a pretty good idea how much light is put out by a 60 watt light bulb. We instinctively know the brightness and color of these bulbs due to having used them for so long. However we need to understand a few new terms. The first of which is ‘lumens’. The brightness level of today’s LED light bulbs are rated in Lumens (rather than watts) because lumens actually quantify the brightness of the bulb (whereas ‘watts’ just represents the energy consumption – not the light output). For example, the amount of light (brightness) equivalent to the old 60 watt incandescent light bulb is 800 lumens. So when looking for a LED bulb to replace your old 60 watt bulb, look for 800 lumens on the package. 25 watt incandescent bulb | 250 lumen LED bulb. 40 watt incandescent bulb | 450 lumen LED bulb. 60 watt incandescent bulb | 800 lumen LED bulb. 75 watt incandescent bulb | 1100 lumen LED bulb. 100 watt incandescent bulb | 1600 lumen LED bulb. Note: By far, the least expensive LED bulb is the 800 lumen because of its popularity and subsequent mass production cost benefits. Light can have different color temperatures, indicated in units called Kelvin (K). Some LED bulbs are dimmable (noted on the label) while others are not, so check your needs. Note: A dimmable LED bulb will work just fine without a dimmer. Also, dimmable LED bulbs require a dimmer that’s designed for LED bulbs. You may have to replace your old style dimmer. Note: For the sake of cost comparison I am going to use a cost of 20-cents per kilowatt hour, which is probably fairly realistic if you include all of the ‘fees’ that are added with your typical electric usage on your bill. The energy consumption of LED light bulbs is remarkably less than incandescent bulbs. For example, a 60 watt incandescent light bulb consumes 60 watts of energy. The equivalent 800 lumen LED bulb will only consume about 8 watts! That’s just 13 percent the energy of your old bulb, or 87 percent energy savings! Wow. That’s a lot of saved money on your electric utility bill, especially if you convert your whole house. It will cost about 21 dollars a month for electricity. If that same home converts to LED bulbs, the monthly electricity cost will reduce to about 3 dollars, a savings of 18 dollars a month, or 216 dollars a year! It is likely quite common for a typical home to have turned on, on average, more than 10 light bulbs during the evening or night (or early morning). So as you can see, the cost savings potential is quite high if you convert to LED light bulbs. Note: If you are considering a solar power alternative energy source for your home, converting to LED bulbs is almost ‘a must’. I converted my entire home with all LED bulbs when I installed my solar powered off-grid system and it has made a huge difference in energy consumption. I also replaced my outdoor motion light floods with LED flood lights. Good stuff. We’ve been slowly replacing all our old bulbs with led whenever they burn out to keep down the sticker shock of replacing them all. I’m curious what the savings would be with led vs those twisty fluorescent bulbs. We replaced all our incandescent bulbs with those years ago and definitely noticed the savings. I wonder if it would be similar. I definitely like the longevity of the led bulbs, I haven’t had to replace any of them yet. We started out using the “twisty” fluorescent bulbs, but couldn’t stand the “warm up” time. We found our usage patterns, the LED bulbs by far are superior in every way to the fluorescent ones. It took us about 10 months to change out all the bulbs to LED ones, and we are thrilled with the lumen output, the quality of the lighting and the cost savings. Had a friend that changed out all $800 worth of LEDs from the old Incandescent bulbs, having a family that does not know there is an “Off” to a switch he stated he was able to pay off the $800 in less than 6 months from the electrical savings. We, along with most people out here changed out to LED’s. Our bill went down over $20 a month. Then the electric company wasn’t happy so they increased their service charges and the bill is the same or higher in some cases. I have read some articles that say the LED is not good for your eyes in the long run. But I think that was based on staring at them for hours! The only think i don’t like is how bright they are. There is no cozy anymore! I believe the lovely “power company” would have raised your rates anyways, they did here. As far as brightness, I need to ask what “Kelvin” of bulbs are you using? I us the “2700 K = Warm White (standard incandescent equivalent)” ones and are nice. LED bulbs are bad for your health. They will all be useless after an EMP. and the power grid will be on after an EMP? Not likely. Additionally LED bulbs are NOT bad for your health anymore that Fluorescents, Lead Poisoning, or watching Nancy Pelosi at the SOTU address….. HAHAHAHA. Please consider 12 volt LED bulbs also. Imports are very affordable. Lots of fixtures in junk yards from later model wrecked cars. My goal is a small easily maintained solar and possible wind array. I’m not looking to do refrigeration at this point although I did use a 12 volt cold machine to built a box in my boat with. It is doable for less than a grand not counting panels and related stuff. At this point I just want something to light a single room and charge small batteries. That has been achieved and spare bulbs are in the Faraday box. I did replace my back door light with a dawn to dusk 2 lamp fixture. The bulbs are not changeable but with their life will probably outlast me. The motion sensor at the back porch has been very annoying as it goes on every time a raccoon, possum or cat walks by. It was cheap enough at Home Depot and I can’t remember the name. I figure the savings will allow me to easily follow through on my new years resolution to hit Ken’s tip jar every month. NRP, thanks for reminding me that its February the 1st. And so, what? Life stops from fear? Of something that maybe might theoreticly happen? And why are they bad? Please provide the basis and/or proof for your statement that LED bulbs are bad for your health. I know that over the past couple yrs, I have heard / read some concerns re health, but havnt kept track. — Just for the record, we do have mostly LEDs. –However, what I will say, is that for street lights, and car headlights, I think they (or at least what is used round abouts where I live) is a serious safety risk. We find when the car coming at you has LEDs, it is hard on the eyes. — We find that street lights with LEDS do not illuminate down at ground (pedestrian) level nearly well enough. It basically seems to leave a dark shadowy spot where the person would be. We had noticed in past couple yrs, as the street lights have been converted to LED, a increase in huge number of pedestrians hit by vehicles. Honestly at first we put it down to huge influx of immigrants and thought they really may not have adjusted to our driving. After having paid closer attention, and realising how bad the Street LEDs are for ground level illumination, I think that is the cause. The other consideration as described in the article is color temperature. The color that the bulb casts. You can get LED bulbs in any equivalent color temperature ranging from warm yellow to cool white. Regarding pedestrian hits, that’s a human problem, not an LED problem. Nope. It’s not Lumens. It’s penetration and that’s exactly what NRP pointed out – it’s the frequency and degrees Kelvin. Soft yellow lights penetrate much better than bright daylight. (Black and white photography and yellow filters come to mind). Harsh white light is hard on your eyes. In Sweden Florescent lights were always soft yellow. LED’s are better that flouro’s in the health department. There’s an imperceptible flicker with flouros – your eyes cant see it directly but your subconscious does. The flicker tires you out. F.W.I.W. The main city council in my state changed all the street lights from sodium to LED’s. At ground level it’s dark. Dangerous. Light photons are all ‘the speed of light’. The frequency is the speed of light. That said, fluorescent tubes are modulated (gas) and do flicker at 60 times per second which our eyes supposedly do not see (until the tubes/ballast begins to go bad). I wonder if the ends really justifies the means. Does using LED bulbs, which are classified as hazardous waste really justify the lower cost in the end? I was forced to research this several years ago (2007) when the government decided to protect us from the horrible energy gobbling Incandescent bulbs and passed a law that would phase them out after a certain date and we would all be forced to buy the toxic CFLs. Fortunately, that law was defunded in 2011 which was long after my simple prepper mind made me step up and purchase a lifetime supply of 60-75-100 watt incandescent bulbs. I wound up buying a case of each even though I already had a bunch stored away. Fast forward to present when the LED (light emitting diode) bulbs have become the rage to reduce energy costs. The cost/price of the bulbs have come down considerably since several years ago and the energy cost to operate them is minuscule compared to the energy used by incandescent bulbs which means both the LED and the CFLs are definitely cheaper to burn than incandescent bulbs. The downside to this is that the LED, like its energy efficient cousin the CFL have both been classified as hazardous waste. The CFLs for mercury and the LEDs for lead and arsenic among other things, the white LED bulb being the least toxic of all of the LEDs, according to what I’ve read. I’m certainly no expert on any of this but, why would anyone potentially sacrifice their health in order to save a few dollars. It seems to me that the more government and industry streamline and upgrade their products the more dangerous their products become. Food, drugs, healthcare, light bulbs, depleted uranium, self driving cars, autonomous drones… when does it all end? I’m not against saving money and I am not trying to be argumentative and I am definitely not some tree hugging, bleeding heart liberal out to stir up trouble where it doesn’t exist. I’m just commenting on some of the issues I’ve had with this particular item when trying to decide what’s best for my household. Man, at this rate, I’m never going to get out of the cave. Just saying. I might add that it’s not only the CFL (twisted florescent bulb) that’s classified hazardous but it’s big brother the Tube Florescent Bulbs that are in buildings, homes, schools by the billions. Yeah, I know. Fluorescent bulbs are nice bright and make it easier to see and read in an office and the shop. But, there are other issues with fluorescent fixtures in the home that are so irritating that I removed them from my bathroom a couple years ago. Issues like having to replace the stupid ballast (actually the ballast isn’t stupid… it’s the operator) and not being able to find one that fits, or finding a ballast that supposedly fits but has three extra wires with nothing on the corresponding end to connect them to, or not being able to find the correct size bulb because either they don’t make them any more or they are sold out, or having to clean up all the hazardous dust and finely broken glass when it gets accidentally broken, or getting broken glass in my shaving mug and not knowing it until it gets caught in the brush and then on my face. I mean… there’s only so much an old fart like me can take. Anyway. Fluorescent lights, LEDs and CFLs are nice I suppose but I opted to continue using incandescent bulbs. They cost more to operate but are so much simpler to maintain and I don’t have to contend with the disposal issues. I like it simple. Thanks for giving a real cost (cheap)to use the LED lights. If you look at the box the cost info provided by manufacturers are based on 3 hours of use a day. I don’t typically have more than 2 lights on so it’s not a big expense for me. I had replaced a couple of bulbs and when they did an energy audit of my house they left me 7 more so guess I’m good! I switched to the spaghetti bulbs but removed them where it was only used briefly, as in a stairway, as they never achieved the brightness they’d have if left on longer, and frequent on & off shortens their life, so I’m told. After having several come loose from their socket i removed all of them and started replacing them with LED’s. I use a 100 watt for the reading lamp as I like the light better. I replaced fluorescent tube lights in the shop with LED strip lights and have found that they interfere with radio reception, so I will use spaghetti bulbs there. LED’s for flashlights are the only way to go. Our electric company sold the city on giving the okay to switch all city lighting over to LED’s stating that they would use 30% less energy. What they didn’t say was that they jacked up the rates on those lights 20% reaping that as profit. So it is still 10% lower rates, but much worse lighting as they are directional and not radial so that all the corner poles cast their light diagonally across the intersection onto people’s homes, not the street. I changed our whole house over, one by one until done. They never last as long as is written on the package! This alters the ‘cost’ savings dramatically. You must have ‘dimmable’ bulbs for timers and photocells also. And the unit must be rated for l.e.d. Bulbs. The real reason I started changing out my 50 Watt halogen track lighting bulbs to LED was the incredible amount of heat generated by the halogen bulbs when they were on. I just felt that the wire insulation could be compromised in the not too distant future with the halogen bulbs and the heat they created. I feel much better with the track lighting loaded with the LED’s and probably saves in house cooling costs during the summer months. Well, not all LED bulbs are the same quality. Some boast to be able to give light for 10000 hours. Mine I used here in Europe (Austria) to give up before they reached 1000 hours. So what? Outstanding article. I note that now, even the Dollar store has been stocking these at a buck a pop: very affordable. I’m changing out my bulbs steadily for LED’s. Good informative post. We tried the Chinese Fleurosent Lights ( CFL) and had 2 of them begin smoking while in use ,generally not a good thing, and we did not like the “wait time for brightness to happen . A friend had one explode while in use , not good either. The LED’s provide great savings . We have moved all our bulbs over to LED and so far are very pleased. We had a plumbing leak from cheap copper and acid water. While changing it out to PEX I found the fixture under the leak had filled with water. (the dome). The fluorescent bulb was still working and the fixture had been filled for weeks, The bulb was totally immersed. I was impressed! Sounds like you picked up some apparent garbage unknown brand bulbs. You mentoined they were only rated for 4 years?!! That’s really bad. LED bulbs are generally rated to last MUCH longer than that. That said, sometimes you win with the unknown brand (all business starts somewhere!) and sometimes you lose. Hey young man, good article BTW. Im wondering how the LEDs hold up on the “inverter” power, you see any differences? They have held up great on my inverter power. No issues. No differences. Since I have a battery bank for energy storage delivery at night, having LED bulbs sure has lightened the load. Incandescent bulb load (watts) adds up fast compared to LED’s. Yar a sly old fox for sure ya know? 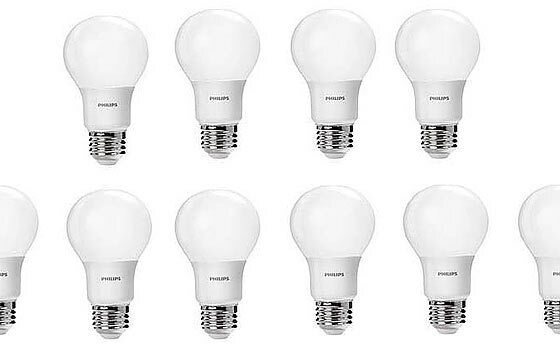 My past experience with Philips bulbs has not been good and I avoid them. Local HS converted to LED and Philips won that bid, and the electrician told me they had a lot of failures right off the bat. I have had better results with the Ecosmart bulbs from Home Depot. Obvious answer is to replace a certain number of bulbs and see how they do. If you still have the same problems with the new good manufacturer bulbs, you have an issue like Oldhomesteader has mentioned. I once rented a house that had aluminum wiring that had similar issues with some lighting fixtures. Had to go put conductive grease on connections and retighten. Aluminum wiring can present a lot of oxidation issues especially in a humid climate. Ken, NRP, Oldhomesteader, & Minerjim; Thanks for your responses and suggestions. I’ll dip into the reserve and get some of the Phillips and Cree bulbs recommended above and see if there are any differences or Ken had it right; just cheap bulbs. Didn’t really think of actual line voltages and freq. issues, but I can see where that would have a part to play as the bulbs must have some type of electronics in each bulb to step V down and convert to usable DC for the LED. And along those lines, yes must keep some in an EMP can for just-in-case! See, this is the reason I come here: To access minds that require me to think about the problem a little harder. Thanks Everyone. i have swapped out two houses with LED’s and not noticed a change in my bill. We leave the lights off the same amount as well. What I’m using (as mentioned earlier) is the Feit 36w mini dual head spot light # 73708 integrated bulbs with 50,000 hour rated life. Comes on at dusk and goes off at dawn. I’m impressed with them but have only had it for a couple of months. Amazon carries them. I work at a very large shopping mall with an attached 60 story office tower. The owner going for Green credentials decided to change out every fluorescent tube for LED tubes. The premise of the exercise was to allegedly save some money but the real exercise was political – a Green Company. There are literally thousands of tubes in the complex – many on 24/7/365. The 500 place carpark alone has thousands permanently on. The in house electricians started replacing all the tubes. It took months. The maintenance on these LED’s is one third more than the old tubes. There’s also the issue of once the general public realised there were LED tubes everywhere theft went up. The technical facility managers then sat down and crunched the numbers. Before the cost of change-out could be amortized the building complex would have past it’s end of life duration. I have been replacing burnt out regular light bulbs with LEDS to save on Ontario’s extremely high hydro. There is a provincial election coming and I will vote out the current government this June. Hydro costs are my number one issue. Your figures are wrong. Check your math. Your figures work if lights were left on for 24 hours a day for 30 days. The figures are correct, given the criteria from the article. If a household hypothetically had ten incandescent 60 watt light bulbs on for 6 hours a day, the approximate monthly cost at 20 cents / kWh (typical cost today including taxes & fees), would be $21.60 per month, more or less. Similarly you can do the math for a LED equivalent lumens bulb as indicated in the article above. Now whether or not a household may operate ten 60 watt bulbs during a typical day is not really the thrust of the article. Instead, it is to compare the equivalent cost savings of LED bulb replacements.